When you think of carrots, you probably think of the long orange root vegetables Bugs Bunny chomps on. 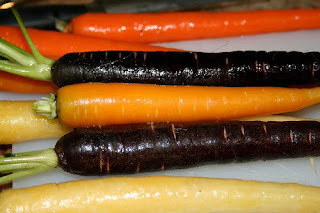 If you've been to a fancy produce or farmer's market, you've probably seen carrots in a rainbow of colors such as purple, black, yellow, or white. So why do orange carrots dominate the market? The simple reason is because they have more beta-carotene than the other colors, making them more nutritious. The more romantic answer has to do with people confusing the name of a fruit and the name of a Celtic water god. Well... In 35 BC a group of former Roman soldiers founded a town in what is now the region of Provence in southern France and named it Arausio after a local Celtic water god. At some point, however, the name "arausio" became conflated with the Provencal word "auranja" which was their version of naranj or orange, as in the fruit. This lead to the town being called Orange. Then in 1163 the town became a the Principality of Orange. Eventually the Prince of Orange added the word "orange" to his house name (and the color to his coat of arms) leading to the House of Orange-Nassau. The most famous member of that house is of course William of Orange who liberated the Dutch from Spanish rule. The Dutch, understandably, loved him and embraced the color orange with enthusiasm. They're national sports teams still wear orange to this day. Now at about this same time, the mid 1500s, orange carrots suddenly started appearing in the Netherlands. It's unclear whether or not this was a new thing. Some evidence exists for orange carrots going back to year 512. Some historians will say that the Dutch bred them specifically to honor William of Orange. Regardless of when or how they appeared on the European root-vegetable scene, the Dutch helped popularize them and spread them around the world. Ta da! Orange carrots. Bugs should have taken that left turn at Amsterdam.